Chrome offers a refined interface where many functions are hidden. The aim is to hide the complexity of operations under the simplicity of use. How to display the Home button to go to the homepage of the browser? How to load a local page? How to get the history of visited pages? How to navigate in incognito mode? Is Silverlight supported by Chrome? Does Chrome support HTML 5? How to set the download directory? How to get internal information? Where can I get the keyboard shortcuts? Where can I find help on how to use Chrome or solve a problem? What is the user agent? Where to get the sources? Chrome can it have extensions like Firefox? Does the browser send any information on me to Google? Why has Google created Chrome? 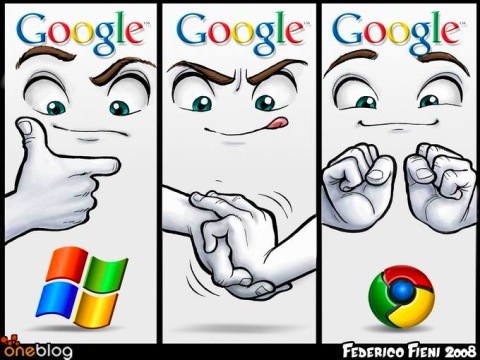 What means the Chrome logo? Chrome allows to know the resources used by a page. How? How to open a new windows? Can I install a web application locally? You can also type F1 (from Chrome) to access the help center. This FAQ does not duplicate the Chrome FAQ by Google that explains how to solve problems you could encounter. Open simply the "Options" menu in tools and in the "Basics" tab, click on "Show Home button on the toolbar." - Type CTRL+O to open a dialog box. Click the right mouse button on the back button, the first at left. If there are several tabs, that displays the list of pages previously shown in the active tab. The list of bookmarks appears below the toolbar. Type CTRL+B to show or hide it. Chrome has a private mode as InPrivate in IE8, called "Incognito". You may open a tab incognito by typing CTRL + SHIFT + N.
You can also test the Silverlight plugin with the demonstrations of the XAML tutorial. They should all work in order. Canvas, the graphics rendering surface is implemented into Webkit. Each new Chrome version bring a higher level of compatibility and the version 5 implements a large part of the specification. How to define the download directory? The directory is specified in the "Minor Tweaks" tab displayed by the "Options" menu. How to get internal information about the browser? cache crash dns hang histograms internets memory network plugins shorthang (the browser crashes) stats version. The full list if given on the Google's help center. F12: Opens the development window. CTRL + O: Load a local file. CTRL + SHIFT + N: Go incognito in a new window. CTRL + SHIFT + T: Display again a tab that was closed. With a sequence, you can redisplay ten tabs after closing the browser. A discussion group was created for it, Google Chrome Help. A help center is also available on the Google site to help users. The user agent is the header that identifies the source of a request (for access to the site) and that is reflected in the statistics. The numbers 0.2.149.27 and 525.13 are version numbers (the browser and Webkit versions) and will change with each new edition of the browser. The AppleWebkit term refers to the version of the rendering engine, borrowed from Safari and Konqueror. Chrome is based on the Chromium project. Go to the site to obtain the source with instructions to compile it. Contrary to expectations, the ability to add extensions were included early in the browser. This is denied by Matt Cutts. We must not forget that the browser is open source and it is easy (for programmers) by reading the source code to know exactly what the program does. There is already a plethora of browsers and competitors are struggling to establish themselves faced with Internet Explorer. But the avowed aim of Google, as expressed in the comic book, is to develop the technology of browsers, to propose something new that will require developers to improve their product too. Browsers have been designed there is a dozen years while the Web was different. To run the applications of Web 2.0, it must start from scratch and create something completely new. There was no official reason for this choice except that the word evokes elegance. However we can see that Chrome is the name of the directory of XUL applications and that in the root directory of Mozilla Firefox it contains the main DLL of the browser. This could have inspired the creators of the software. Microsoft has in the past drawn up plans for a multimedia system named as a first step Chrome, then Chromeffect. The project was then merged with DirectX. The chrome logo has changed in March 2011. Old logo. New logo. Click the right mouse button over the page. At the bottom of the popup menu, click on Inspect elements. A window will open. Click on the "Resources" tab. Reload the page or any page for loading times or sizes of elements. The Time and Size menu allows you to switch from one to another. In other words, how to have a different version of the browser on the desktop. Type Ctrl-N.
To open a new tab click the plus sign or type CTRL-T. This is done by Prism with Firefox, and Chrome has a solution that is also very simple and automatic. Howewer Chrome must be always loaded while Prism uses a lightweight version of Firefox. See explanations on Google Code. Your note are then typed from the menu or with CTRL-S. This works on any recent browser. Google experiments bookmakrs synchronization on its services and this may possibly remove your bookmarks.